Living in Ord exemplifies simple, safe small town living amidst breathtaking beauty in the scenic North Loup Valley. Boring and flat? Hardly. 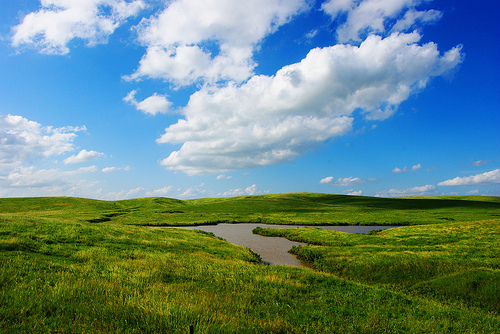 The traffic, noise and crime of the city opens up to rolling green prairie plains, scenic river valleys, abundant wildlife and a serene pace of life unrivaled in Nebraska. On this website you will find information about our community that has been featured in the New York Times, the Wall Street Journal, the USA Today and National Public Radio for its progressive attitude and community-minded spirit. Have a look around, and welcome to Ord. In the heart of the Loup Rivers Scenic Byway, Ord is centrally located within 30 miles of the Calamus, Sherman and Davis Creek Reservoirs and 25 miles from the North Loup, Middle Loup, Calamus and Cedar Rivers. Ord is a gateway community to the ecologically unique Nebraska Sandhills, “the largest sand dune formation in the Western Hemisphere.” Within that stretch of rivers, valleys and rolling hills is cropland and natural habitat for a multitude of wildlife and plant diversity. If you’re seeking open space and room to breathe, we have it in abundance.